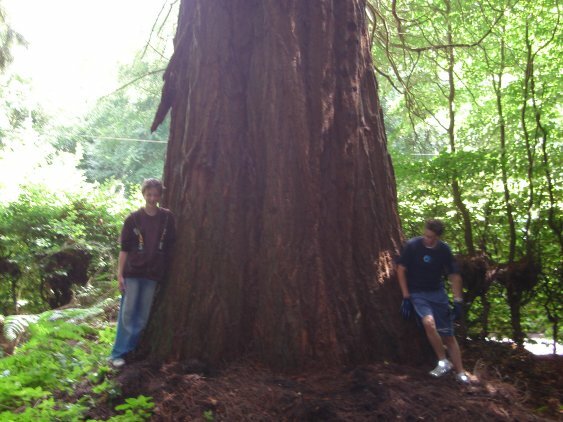 Thanks to Luke who sent this picture of his friends beside this lovely Giant Redwood in Polecat Woods, Lion Lane. Luke's friends standing next to the tree make a good comparison in size. The Tree-Register mentions Polecat Woods as "A sheltered valley woodland with some of England's tallest trees." Luke and friends have put tremendous effort into getting even more photographs and measurements of the trees in his area including Black Down, Woolmer Hill and Marley Common. Thanks again Luke, and thanks also to all your friends. Happy Redwood hunting! A visit in 2006 to Polecat Copse allowed us to confirm that these trees are among the widest so far recorded in the U.K.
Luke sent an update in May 2008. He came across what he belives to be a Coast Redwood and he says there are also many tall Douglas Firs in the forest. 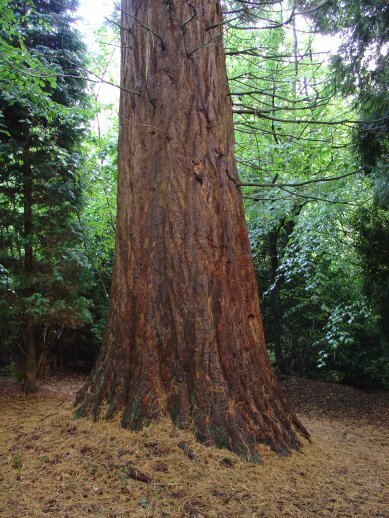 It does appear to be a Coast Redwood based on the foliage and on the overall appearance and shape of the tree. Well spotted! Thanks to David for the above photograph of T-Rex. He was surveying Lion Lane in Haslemere and measured the height of this tree at 43.4 metres using a measuring instrument called a Nikon Forestry Pro. 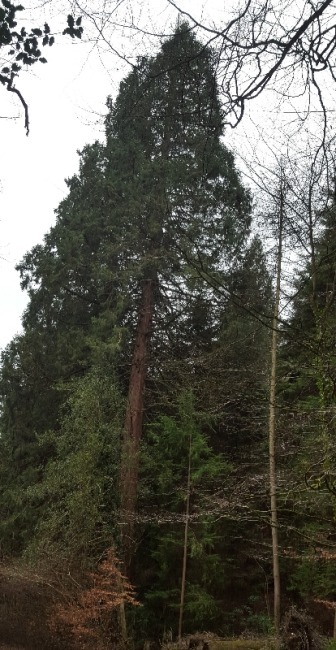 This has been added to the Top Trunks page as one of the 20 tallest trees I have measured in the U.K. Although I usually only include trees on the Top Trunks page where I've made the measurement myself, David is a highway tree inspector and has used a sophisticated instrument made for measuring trees.